You can now edit the sections of your home page and other custom pages using the same WYSIWYG editor you use for e-mail messages. Each section can contain a virtually unlimited amount of information. You can apply background colors, borders, and shadow effects to each section, and control the maximum width. Sections can be moved around the page and you can control which sections can be viewed by the public without logging on. Widgets can display information from your database. There is a new widget that lets you display your troop's Eagle scouts. 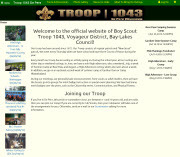 Girl Scouts and Cub Scouts can now add custom pages to their site using TroopWebHostGS and TroopWebHostCS. We also added the ability to remain logged on from up to five devices simultaenously. Troop 1043 of DePere, Wisconsin! Informative front page includes the troop�s history and information about how to join � a great recruitment tool. We�re jazzed about all the custom pages, and are especially impressed with the �Driving Directions� page. Copyright 2016, Web Host Services LLC. All rights reserved.